What could be more jaw-droppingly majestic than the sight of one of the world's largest animals hurling its multi-ton body from the water? Two of them doing it at the exact same time. 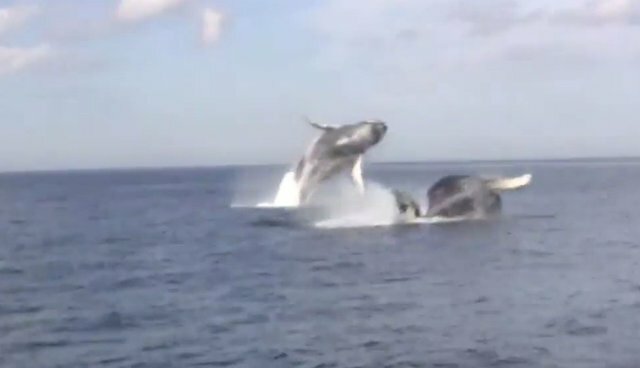 Over the weekend, whale watchers off the coast of Newfoundland were treated to one of these "double breaches", when two humpbacks leapt out in unison, crashing down together with an enormous splash. Such events are extremely rare, and given their unpredictability, have only been caught on film a handful of times. In fact, double breaches are considered by some to be the "holy grail" of whale watching experiences, seen only by a fortunate few. Thankfully, a camera was rolling when this one occurred, so the rest of us could share in the excitement. Even seasoned whale guide Joe O'Brien says that he'd never seen anything like it before. "I can't tell you how happy I am," O'Brien told the Canadian Press. "I'm doing this all my life -- it's been 30 years. This is our 30th anniversary, and I'd never seen a double breach. I heard tale of double breaches, but I'd never actually seen one. Today I saw this double breach, and I couldn't even describe the position. I was that excited."